J.K. Rowling has made no secret of her contempt for people like Donald Trump and Nigel Farage, often taking to Twitter to respond to their nationalist rhetoric where she inflicts some serious burns with her words. Now, with the second installment of Rowling’s FANTASTIC BEASTS franchise out in the cinemas, the highly celebrated author has revealed that she is upping the ante by giving us a cautionary tale about the evils of fascism and racism. As we saw in the end of FANTASTIC BEASTS AND WHERE TO FIND THEM, Gellert Grindelwald (Johnny Depp, MURDER ON THE ORIENT EXPRESS) is up to no good but, fortunately, he’s now safely ensconced in wizard prison thanks to MACUSA (Magical Congress of the United States of America). At the start of FANTASTIC BEASTS: THE CRIMES OF GRINDELWALD, the evil practitioner of the dark arts breaks out in grand fashion and makes his way to Paris. With the Department of Magical Law Enforcement meekly on Grindelwald’s tail, Aldus Dumbledore (Jude Law, KING ARTHUR: LEGEND OF THE SWORD; SPY) contacts his favourite former student, Newt Scamander (Eddie Redmayne, THE DANISH GIRL; THE THEORY OF EVERYTHING), and asks him to go to Paris to capture Grindelwald first. But the magizooligist has his own problems to deal with. Ever since his fight with Grindelwald caused extensive damage to New York City, Scamander has essentially been put under house arrest and is not allowed to leave England. His relationship with the Auror, Tina (Katherine Waterston, LOGAN LUCKY; ALIEN: COVENANT), has also hit the rocks as she believes he is now engaged to be married to his old Hogwarts flame, Leta Lestrange (Zoë Kravitz, KIN), but Lestrange is actually engaged to Scamander’s older brother, Theseus (Callum Turner). Scamander and Tina, we learn, aren’t the only ones with relationship problems either. Tina’s sister, Queenie (Alison Sudol), has put an enchantment spell on her No-Maj boyfriend, Jacob (Dan Fowler), to keep him around. When Scamander releases Jacob from the spell, Queenie takes off and heads to Paris too. Meanwhile, Tina, Theseus and the mysterious Senegalese wizard, Yusuf Kama (William Nadylam), are looking for Credence Barebone (Ezra Miller, JUSTICE LEAGUE), hoping to reach him before Grindelwald can put his hooks in him and turn him over to the dark side. Credence, however, has other things on his mind. He wants to find his mother so, along with his cursed girlfriend, Nagini (Claudia Kim, THE DARK TOWER), he heads to Paris as well. If this is all confusing, join the club. There are so many storylines here that it’s an absolute slog to keep up with it all and far too many characters – both major and minor – get shunted to the sidelines. (The minor ones will presumably feature in upcoming sequels.) I wasn’t a big fan of the first FANTASTIC BEASTS film but at least that film had interesting animals to enjoy. 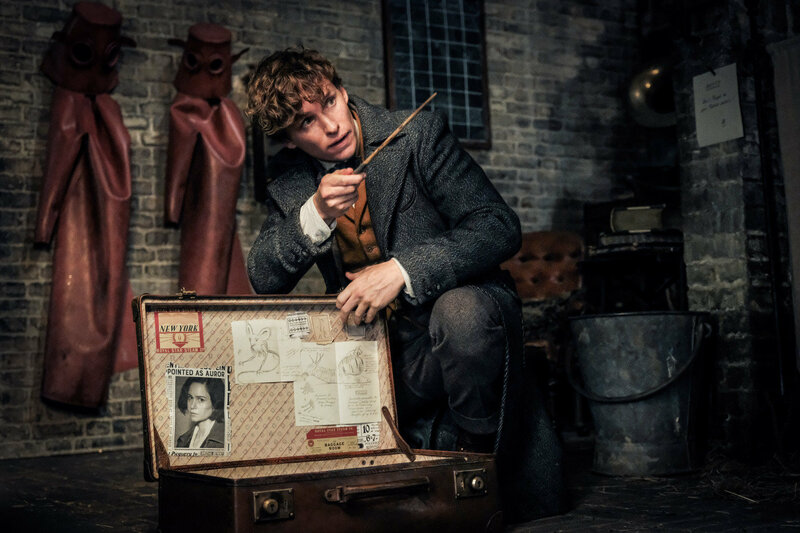 Here, the niffler returns in a less than satisfying role, and we see a couple of new fantastic beasts, but there is little else to be in awe over with this film. It’s all one bloated mess that culminates with Grindelwald giving a Nuremburg rally-inspired speech to the masses of Paris’ wizards. With a running time of 2-1/4 hours and an implicit message that will go over the heads of most kids and more than a few adults in the audience, it’s hard to call this entertainment the whole family will enjoy. There are still three more installments in this franchise to go culminating, I assume, with Scamander triumphing in a final showdown against Grindelwald. If Rowling and the producers want to keep the fans around right to the end, they’d better start focusing more on character development and less on story padding.